I sent several images into the Greater Denver Audubon Photo Contest-Share the View last fall. Three of the images made the top 250 photos and will show up on the front page of the contest’s website. Here is the first of the three, “Life on the Edge” (The Squirrel and the Owl) scheduled for Tues. March 26, 2013. “Konkaree” is sounding from the wetlands this morning. It is a great song to hear in early March. If I had not been alone on my walk, I may have missed it all together. It was subtle and in the background. The first Red-winged Blackbirds have returned from warmer climates! A cold-tolerant bird it will now claim it’s marshland by singing and posturing to all males that come close. 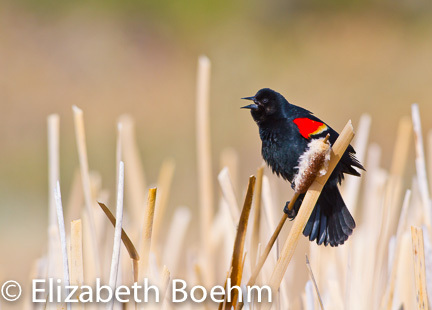 The Red-winged Blackbird will allow several females into the marsh as they do practice “polygany”. In this case the male will court several females and defend “his” marsh from all other males. We are starting to get winter weary here in Wyoming but all of us know that the cold will linger for several months to come. I so enjoy the return of our birds as it does bring the promise and hope of warmer temperatures and greener backgrounds. The Red-winged is one of these early arrivals and will sing it’s heart out in the next several months. Welcome back!